In my younger years I once loved listening to nasheed (Islamic songs). Many songs I listened and memorized from groups of male to female nasheed group. I even handled a group of nasheed during my college years about 20 years ago. The rise of Islamic living was about to blossom at the moment. Hijabis had been started to appear here and there in campus. Nasheed changed the way I spent my time. The guilty feeling of listening to music became smaller. I don't listen to music anymore now (gonna tell you later about it insha Allah) but nasheed was one good choice for me. What I liked the most from nasheed is the rhyme. I am quite an auditory learner so I found rhyming is so much fun. It is more fun when comes to learning something. Kindergartens learn things through songs and rhymes as well. What about learning Islam through rhymes? I have a great news! 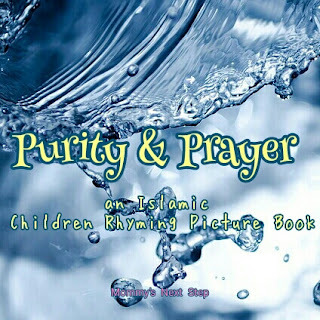 Book publisher, Prolance, has released a book called Purity & Prayer: Rhyming Picture Book of Sacred Rulings by Ameena Bint Abdir Rahman and illustrated by Reyhana Ismail. What? A rhyming picture book? Double surprises! I have never read a book like this! Prayer is like we’re visiting Allah. We go the time they say to attend. We wear good clothes and comb our hair. Go all dirty? We would not dare! For if we don’t we will get lost! Ignoring them would not be fair. We keep in mind all these things. Masha Allah, I love this poem! This book contains 4 parts: Du'a & Salah, Purity, Prayer, Appendix. The first three parts describe fiqh in a fun way. There is a short explanation about the fard and wajib, such as the fard of payer, what break our wudu, etc. While Appendix provides clarification. In Purity children learn about water for taharah, which part of our body should be washed and which should be wiped. In Prayer there are explanations in rhymes about what to do to start salah, what to recite, what breaks our salah, the obligatory and the necessary of salah, etc. The book's purpose is to give children and parents access to knowledge that makes one’s worship valid, sound, and proper in a fun way. I think the author did it well. You can buy it at Amazon. It is really a fun way as the book is sooo colorful! There are 33 pages including the cover and back cover. I love the illustration. Even my son got amazed by the colors and size. I think children are gonna love to read the book. Instead of understanding something heavy the boring way children can do it the cheerful way. Well, have you read this book? If you have, what do you think? If you haven't, what comes to your mind about it? Yes, mbak. I loved it when I was younger. Bener mbak. Saya suka banget. Bisa pesan via Amazon lho. My oh my! How lovely! I bet it's one of the best ways of learning Islam with kids. Can't agree more. You can buy it via Prolance or Amazon.